It seemed to appear overnight. I've never seen it in my garden before. Look at my poor onions. Downy Mildew seems to be the likely culprit. Lots of rain and mild temperatures seem to be helping it along. A good hot dry spell might knock it back. In the meantime I gave all of the alliums a good spray of Serenade fungicide. I sure hope the onions aren't doomed. It's catchup time for harvest reporting because I was away for a few weeks. Before I left I harvested a number of the usual suspects. 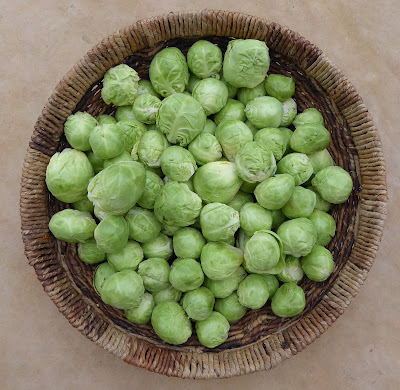 I don't remember what I did with most of the late February harvest except for some of the Brussels sprouts which I shredded and dehydrated. And just before I departed I harvested the first somewhat immature heads of Batavia broccoli, some about to bolt Mizunarubasoi, and perhaps something else that I can't remember now because I gave all those veggies away without making any record of the harvests. 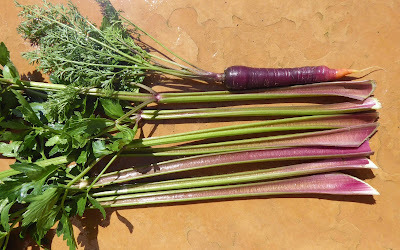 The garden fared pretty well in my absence so I was able to resume harvests of a number of the overwintered vegetables. The carrots are still sweet and crunchy although some of them are getting a bit weird shaped. One of the celery plants started to bolt just before I left so I cut out the main shoot, the side shoots are starting to bolt but the plant still has some nice stalks. 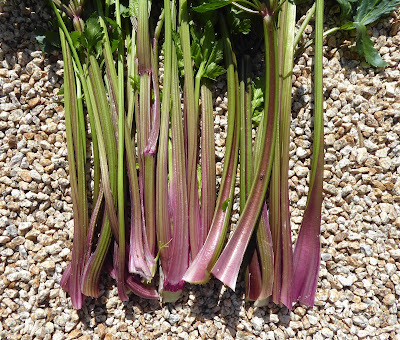 The other celery plant is slower to bolt so it still has really nice stalks. They are still crunchy, not too stringy, and great tasting. I used some of those stalks plus a carrot and some of the sprouts below to make a Brussels Sprouts slaw with what has become my favorite dressing of creme fraiche, horseradish, rice bran (or peanut) oil, maple syrup, and apple cider vinegar. The Mizunarubasoi is still good eating even though it is bolting. 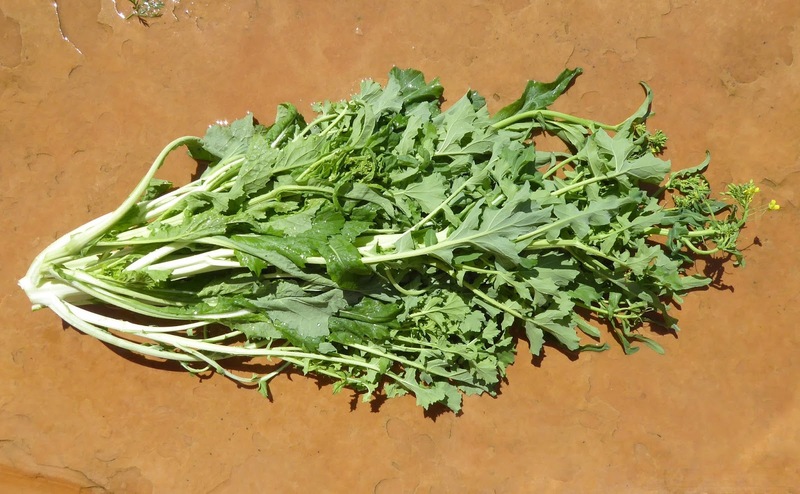 It makes a great substitute for rapini. Last night I blanched and sauteed some to accompany some slow cooked Petaluma Gold Rush beans that I had simmered in a seasoned slightly sweet tomato sauce. The side shoots that I found on the Batavia broccoli when I got home were bigger than the main heads that I harvested three weeks previously. We enjoyed a couple of those in a veggie saute. 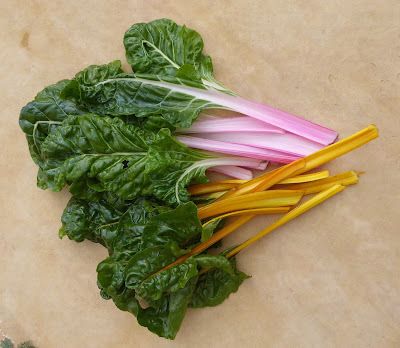 I harvested most of the leaves off of one of the Syrian Medieval chard clumps (I allow 2 or 3 plants to grow together in a clump) because it is starting to bolt. We enjoyed that prepared in a Mediterranean style with chopped onion, pine nuts, currants, and a splash of red wine vinegar. It was a delight to come home to veggies fresh from the garden. The one thing I miss most when traveling is good vegetables, they are so hard to find in restaurants and completely impractical to carry when backpacking. Dear Garden, How Did You Fare While I Was Away? My poor veggie garden was on its own for over three weeks while Dave and I were away tramping the trails in New Zealand. I expected to find a total mess when I got home. Visions of bird pecked, rat ravaged, mouse bitten, bug infested plants filled my head. I figured I would find blooming Brussels Sprouts and a host of other bolting overwintered plants. The wild wet weather of January and February gave way to warm sunny dry days as soon as we left, so I added parched puny seedlings to the list of woes because I was counting on rain and hadn't turned the irrigation system on. Would there be anything left that was edible? Much to my relief, the worst of my fears didn't materialize. The cover crop in Bed #1 was just getting going at the end of February. I removed the protective Agribon cover the afternoon that we left which left a lot of small tasty seedlings at the mercy of the birds. I guess the abundant rain this winter has provided the birds with enough natural greens that they don't have to come to the all-you-can-eat buffet that my garden provided during the past few dry winters. 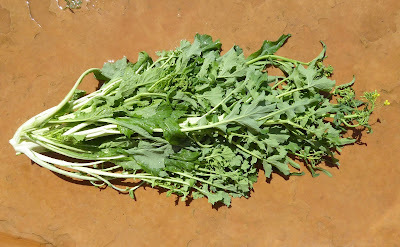 Even the tender new pea shoots that are usually a favorite bird snack have been spared. I'll be plucking these tender greens for myself. Some of the early planted Robin Hood Fava plants even have beans that are mature enough to harvest! I usually have to wait until the end of April or early May for the first favas. Not sure what is going on with that foliage, but it isn't affecting all the plants so I'm not concerned. The overwintered Aji Amarillo plants are looking quite shabby but still have a lot of life left. I removed the top cover before I left because the chance of frost was nearly zero and I wanted them to get more light and rain but didn't have time to dismantle the entire protective cover. I'll wait another few weeks before I trim them back and move them. Over in Bed #3 things are coming along better than expected. 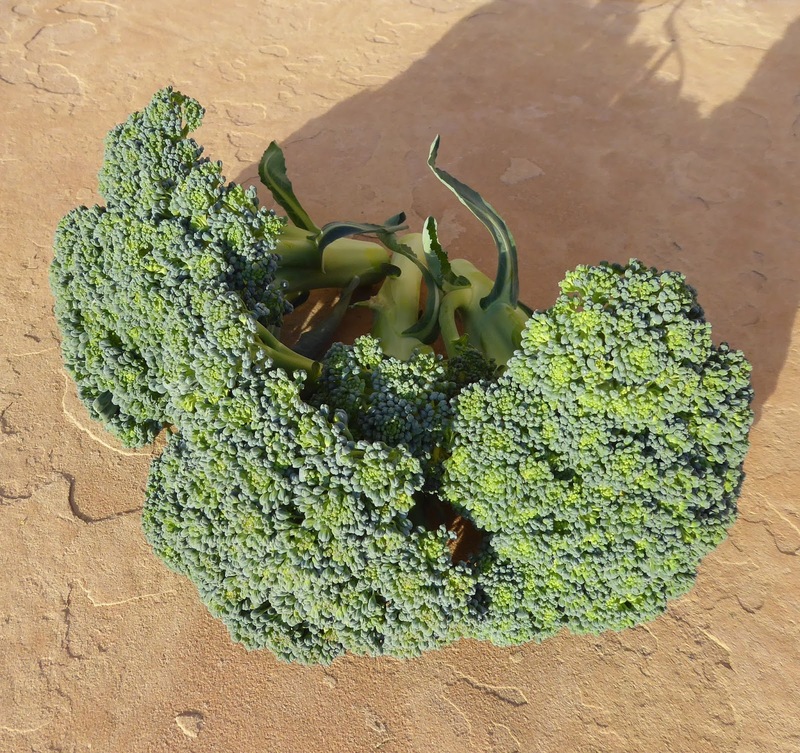 The broccoli plants are protected by hardware cloth and fabric. The plants produced their main heads just before I left, I had to harvest them on the small side and give them away because I didn't have time to either eat or preserve them. Hidden away in all that foliage I found three really nice side shoots and there should be more to come. The spinach seemed to fare well. A brief look revealed a few bolting Merlo Nero plants and some super sized leaves of Gangbusters spinach. The few Golden Corn Salad plants that I left between the rows have filled in the gaps between the Merlo Nero and been overwhelmed by the Gangbusters. There were just a few weeds growing amongst the onion seedlings. Most of what is growing with the onions is baby Cilician parsley plants that I plan on harvesting as babies. The onions don't seem to mind the competition so far but I've already started to cut the parsley plants that are closest to the onions. Shallots in the foreground are doing ok. They are still small because I planted them rather late. There were some casualties in the I'itoi onion patch. I planted them too close together and all the rain knocked them over and the plants that were most crowded in the center started to rot. I cut all the plants down to a couple of inches the week or two before I left, but it wasn't enough to save some of them. I hope I'll get enough good bulbs to make a better effort at growing them again next season. Bed #4 is where most of the messes are. 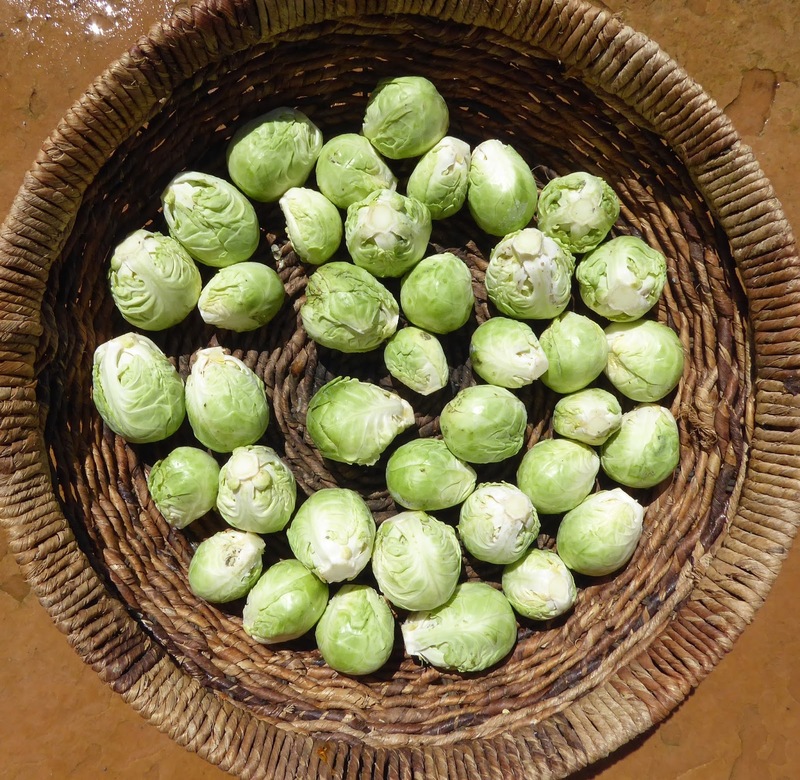 There's good and bad in the Brussels Sprouts. The Gustus variety held up the best with a number of decent sprouts ready to harvest. There were lots of aphids in the plants, especially in the leafy tops, but there are also quite a few hoverfly larvae chowing down and helping to clean up the mess. The Hestia variety didn't fare quite as well, the remaining sprouts aren't quite as nice and this one plant is definitely bolting and suffering from some rotted greenery, but I think there's still sprouts to salvage. The chard looks good but I noticed that the Syrian Medieval chard is starting to bolt. That's ok, I'll use it first and then move on to the Golden and Peppermint Stick chards which usually bolt later in the spring. The shoots of the Syrian chard are supposed to be good eating also. 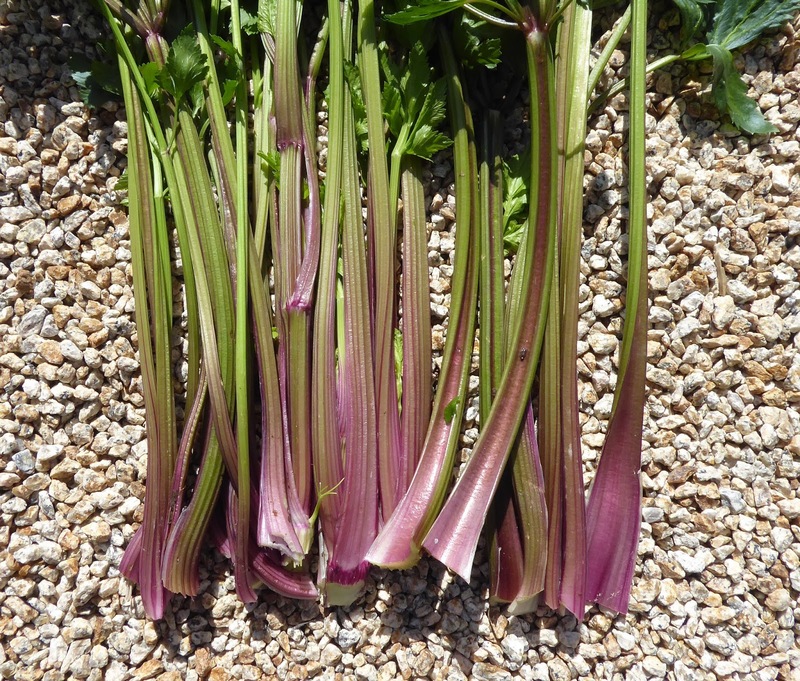 There is some bolting happening in the celery patch, one of the plants is starting to go, but the other plant still has some excellent stalks. It's time to sow the new round of seeds, the celery that I'm harvesting now was sown on March 2 last year. Another holdover from last year is the Dazzling Blue kale. There's 2 plants there, only one of which is bolting. 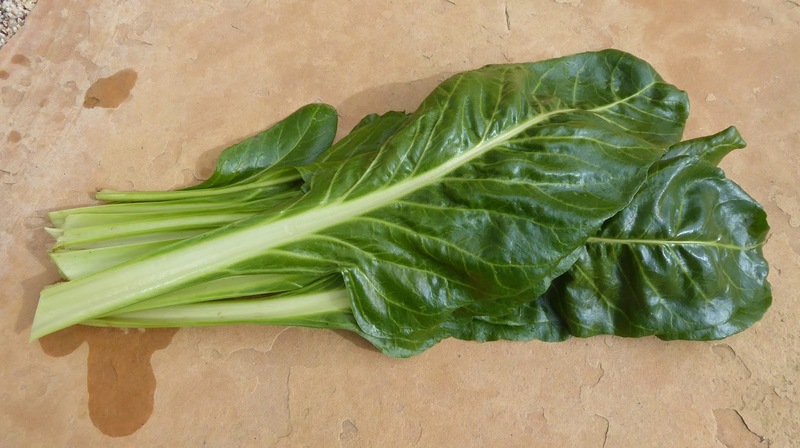 Another bolter is the Tronchuda Beira cabbage/kale. It started to bolt back in February at which time I cut out the main stem and all the large leaves and left some side shoots that I would have harvested if I had been around to do so. The good new is that the parsnips haven't bolted. And neither have the remaining carrots. 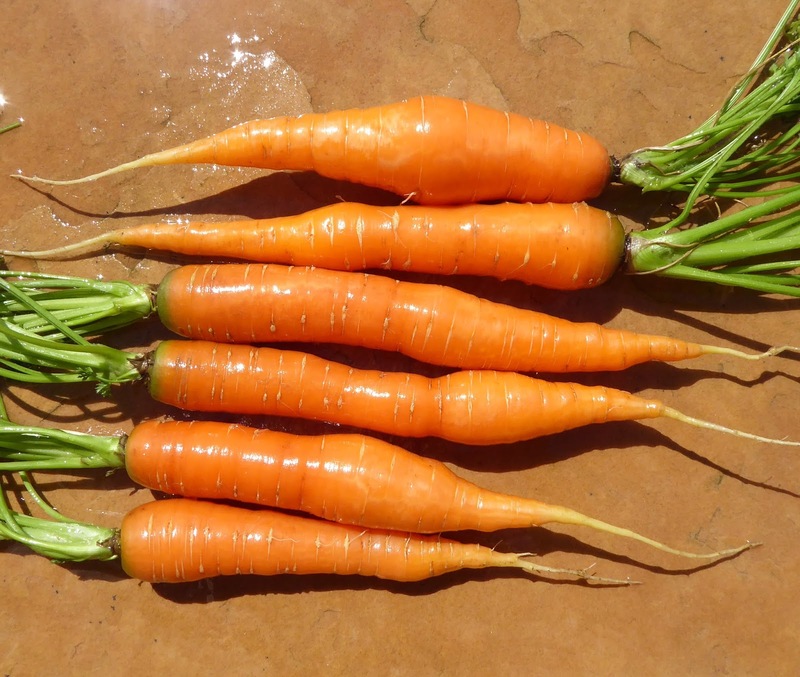 The carrots that I sowed just before I left are pushing at the Agribon covering. Radishes that I sowed are also looking pretty good. Late started radicchio is looking better than expected. But I am a bit disappointed at the kohlrabi which seems to be rather slow to size up. But at least it's alive and not totally infested with aphids which were starting to colonize when I left. So that's the state of the garden after more than 3 weeks of complete and total neglect. Not as bad as expected. Now I have to get cracking on sowing spring vegetables, tomatoes, and peppers. Oh and there's a boat load of weeds that need to be dealt with too.